Every pet owner faces issues with pet smells and dander on their carpet. As much as you love your pets, there is a challenge of keeping your carpets clean and fresh smelling. This is why every pet owner should schedule a professional carpet cleaning every 6-12 months to maintain the appearance of your carpets and get rid of pet odour. What are the disadvantages of not scheduling a regular professional carpet cleaning when you have pets? 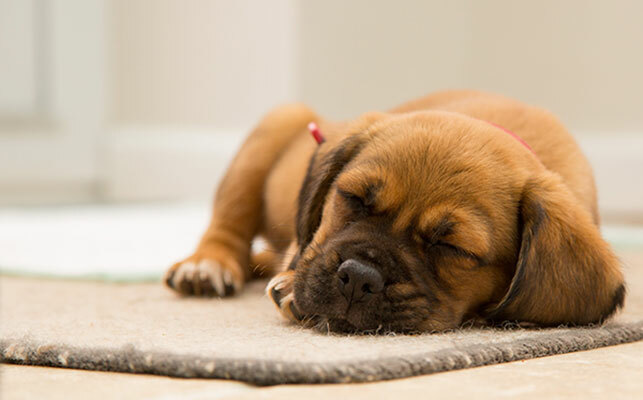 Your pet’s urine can penetrate the floors and contaminate your carpet fibres. Urine deposits can change the structure of the fabric causing a permanent stain. Pet wastes can attract bacteria growth and may cause illnesses. Untreated pet accidents can make the smell more pungent and harder to eliminate. Chem-Dry’s P.U.R.T.® (Pet Urine Removal Treatment) is a proven and tested process for removing the source of pet odour found in dog and cat urine. When you clean pet accidents on your own, you might only be masking the odour but the bacteria may have already seeped into your carpets. P.U.R.T can remove an average of 99.9% of pet urine odours from carpets and is specially designed to remove pet urine odours at their source. First, your carpets will be inspected with a special UV light to detect any urine deposits. Next, contaminated areas are rinsed using Chemdry’s deep cleaning, patented Hot Carbonating Extraction cleaning process to remove any liquid or loose urine crystals. The affected areas are soaked with the P.U.R.T mixture. Finally, the face fibres are lightly extracted and allowing P.U.R.T. to dry.